I love planning trips probably as much as I love traveling on them. Knowing what is nearby, what pictures I want to take, and, most importantly, where I’m going to eat, makes the trip a little easier on the brain while I’m there. I lean on all of my pre-trip research so I can sit back and enjoy my travels. I know I’ve talked about this in a few previous posts (here and here), but I like to think I have trip planning down to a science. Of course, I need one key thing to keep my sh*t in order. My phone. Before I get into it though, I want to be clear, this post will NOT cover how to buy a cheap plane ticket. There are thousands of blog posts that talk about the best time to buy a ticket, how to use points, and getting upgrades. I’m not going to do that. Probably ever. Honestly, most people can’t recreate those specific scenarios and I don’t want to set unrealistic expectations. Ok, now that we have that out of the way, let’s talk trip planning. This is my end-all be-all for trip planning. I love getting recs, and Pinterest crowd sources awesome posts on the latest and greatest in every destination. I like to get lost in Pinterest sometimes. I start by searching for my destination and then add some keywords like “city guides” and “restaurants”. Then pin it to a general trip planning board or a board you created for the specific trip. Spot is another great resource. It’s a newish app that lets you create lists of places. You can create your own lists or follow others for inspo. Lists can be organized however you want. You can create them around a city or common things. For example, I created a list of my favorite spots in Nashville and I also created a list of my favorite places to Instagram. Once you download the app, you can follow me @meaghan. After I stalk places on Pinterest and Spot, I save them to a Google Map. I actually save them twice (which isn’t efficient but I’ve added this to a long list of feedback for Google). First, I save the location to my general map, then I also save it to the map I created on Google for this specific destination. For example, this is a screenshot of my Paris Google Map. Google Maps are so incredibly helpful when you’re walking around and you need a drink, shop or restaurant. I use this everywhere I go from Paris to Rome to Nashville. I’d be willing to share my Google Maps with everyone, if that’s something you’d be into. Let me know in the comments! I’m crazy obsessed with Instagram. I’m such a visual person, and this app just gets me. I’m going to do a whole post on my Instagram tips but for the sake of trip planning, I’m going to focus. Click on the magnifying glass, and search the general location (like the city) and look at the top 9 posts that show up. Where are they? What hashtags are they using? Search those locations and hashtags in the top 9 results. See what pops up. Check if any of those users in the top 9 have cool pics of restaurants, museums, and insta-worthy spots. What about their followers? Add anything noteworthy to your Google Maps, add it your Spot list and/or pin the Instagram post (on desktop) to your Pinterest board. 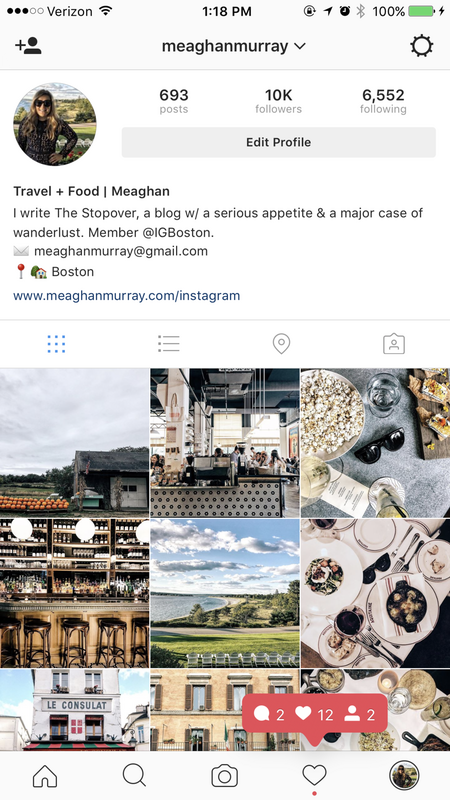 Of course, you can always follow me @meaghanmurray for travel and food inspo. The beauty of all of these apps – they are on your phone! Being able to reference any and all of the research you do before a trip while you’re on the trip, makes it so worthwhile. Not that we need another reason to keep our phone in our hands at all hours, but when you’re traveling, it’s nice to have a security blanket. Just make sure you keep an eye out for those pickpockets. Sneaky bastards! Now I know how you do it!!!! Here’s a question: would you follow me around like I follow you? Great post! I gotta check out Spot – thanks for the tip!